Piqua, Ohio, May 9, 2017 – Hartzell Propeller’s new five-blade composite swept tip prop has received FAA approval for installation on the Piper M600 turboprop aircraft. Hartzell’s newest propeller was designed specifically for the Piper M600. It features thin, maximum efficiency airfoils providing increased performance and outstanding ramp appeal. The durability of the new Hartzell prop integrates nicely with the Piper M600 and enhances the aircraft’s outstanding reliability characteristics. “This new program is another example of Hartzell working closely with a world-class OEM to bring out the very best in airplane performance,” said Hartzell Propeller Executive Vice President JJ Frigge. 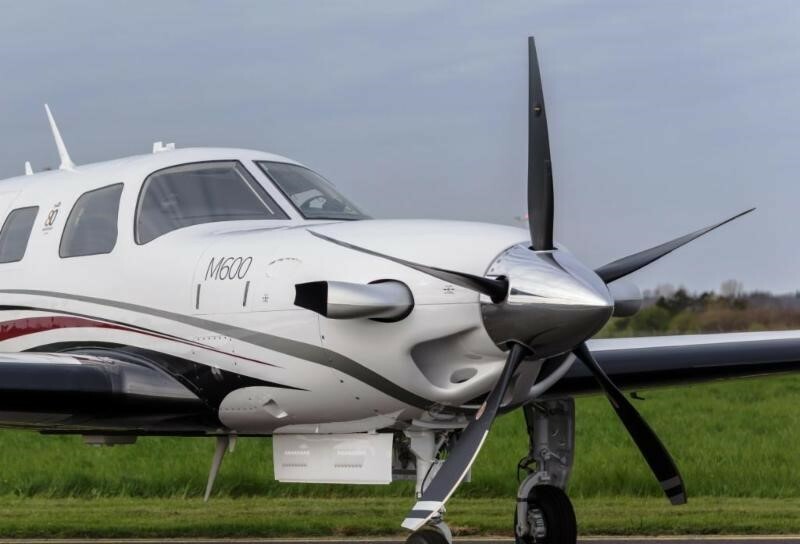 “We are just delighted to carry on our long tradition of working with Piper Aircraft, and this new propeller will further improve the excellent performance envelope of their flagship aircraft,” he added. The advanced design of the carbon composite propeller blades allows for an unlimited life certification and makes them five to 10 times stronger than similar wood core blades. The design features a stainless steel shank, nickel cobalt leading edge, and mesh erosion screen for FOD protection. Hartzell five-blade composite propeller is offered as a Piper factory option for 2017 on new M600 aircraft. The Piper M600 features a new, clean sheet design wing and a sophisticated Garmin G3000 touchscreen-controlled glass flight deck. The M600 seats six and is powered by a Pratt & Whitney PT6A-42A 600shp engine. The aircraft has a maximum cruise speed of 274 ktas/507 km/h, a max range of 1,484 nm / 2,748 km, and a standard useful load of 2,400 lbs. / 1,089 kg.The G3000 avionics suite is the next generation of Garmin architecture, offering the most comprehensive, intuitive, and technologically advanced package on today’s market.